Burning votive candles as an offering for prayer intentions and intercessions is a time-honored tradition of Christianity. Angel Direct offers a wide selection of votive candles for all budgets and needs, including disposable, tealight, tapered, straight-side and glass-enclosed candles; different vessel types, and a wide variety of burn times and colors. Use Angel Direct’s “Shop By” filters on left side to easily shop for votive candles by votive type, burn time, color, vessel type, brand and price. 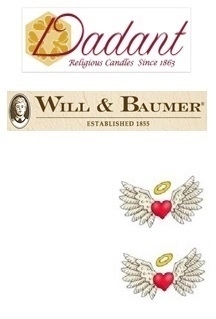 AD Heavenly ValueTM - Compare Angel Direct’s price below for the type of votive candle your church uses, including Dadant and Will & Baumer 4-hour disposable votive candles, to what you’re currently paying! AD Heavenly ValueTM – Before placing your order, use Angel Direct’s shipping estimator (add product to cart, then select “View All”) to see our unbeatable UPS Ground shipping rates on all votive candle products.